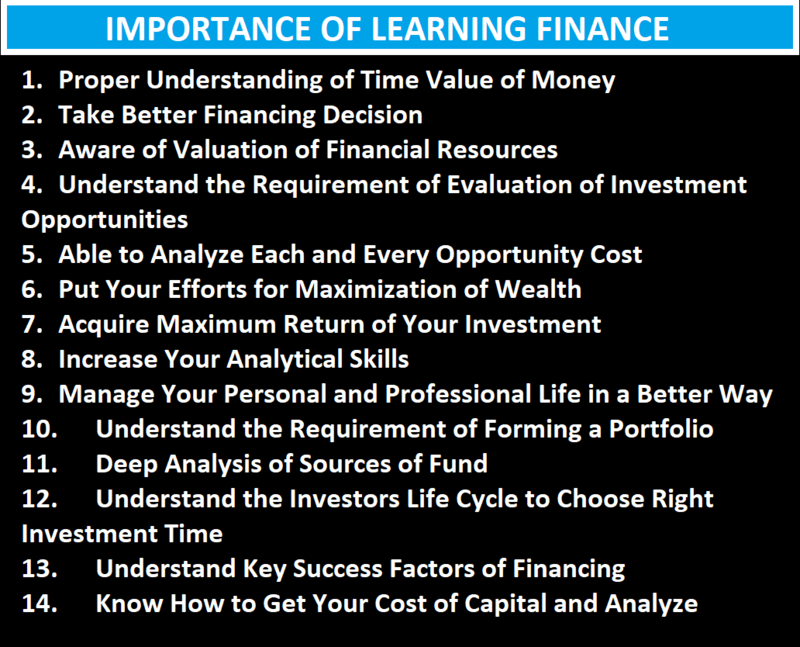 Home » Posts tagged "Proper Understanding of Time Value of Money"
Finance is the lifeblood of every organization because without financing it is impossible to do any kinds of economic activities for the business organization. For profit-making organization or not for profit organization, financing is one of the core task done by the finance manager but whenever we want to evaluate the cost-benefit analysis or prospects of the profit-making organization we have to think about the proper analysis of financial statements (income statement, cash flow statement, owners equity statement, and balance sheet). In addition to this analysis finance manager is required to develop a financial model, ratio analysis, forecasting of different accounts, cash budgeting, common size statement analysis, sensitivity, and scenario analysis, adapt least cost financing sources, investment decision in the profitable sectors, forming an optimal portfolio to diversity investment for reducing overall risk. For all these analyses a finance manager or financial analyst has to have proper knowledge of financial terms and their changing effects on the financial condition of an organization. Although a finance manager needs to have different types of qualities from my point of view these are the qualities that a finance manager of a financial analyst must have. Taking financial decision without any kind of analysis is throwing a stone in a dark hole, but an effective financial decision must not be this kind. For effective financial decision, there must be a proper analysis of historical data and all existing privately and publicly available information. So that finance manager actually can assume something about a financial outcome that may happen. Time value of money is one of the important concepts that must be considered when making investment or financing decision for the company. Because by using this concept we can calculate the present value and future value of an amount. That’s why every finance manager has to have a clear understanding of the time value of money concept for adapting the right investment or financing alternatives. Now a day’s technology made it easy to do analysis with the help of computer-based software. Popular software used for analysis are Microsoft Excel, SPSS, STATA etc. so financial analyst or financial manager must need to know how to operate this software and how to interpret the result generated by this software. Whenever a finance manager wants to analyze the financial performance of the company, he/she will be required to have financial information about the company, so through communicating with the respected department manager collect information. Also what kinds of information manager are asking must be conveyed clearly to the respected parties. Another important qualification of financial manager or analyst is proficiency in numerical calculation. For financial decision making most of the case we mainly use quantitative data which is a numerical number. Ability to calculate and understand numerical variables is required to take the right financial decision. One of the main tasks of a financial manager or portfolio manager or financial analysis is to find out the optimal portfolio for the company from the existing investment opportunities. You know that diversification is the only way through we can minimize our unsystematic portion of the risk, that’s why managers always try to diversify their investment to maximize the return of the company. A person who has the ability to analyze the market and identify the optimal portfolio through diversification is to be the best financial manager or financial analyst for the company. One of the important things that a financial analyst has to do is forecasting about the future. Forecast about financing requirement and investment decision considering the future economic prospects or recession. Another thing is the forecast about the growth of the overall industry and the company. Sometimes there may have the opportunity of making huge money through investing risky project short-term basis and these types of opportunities mainly chosen by the aggressive financial managers. Successful financial managers are quick decision makers and their decision is most of the time is an effective one. So quick decision making is the ability of a person which helps to become a financial analyst. Although most of the cases finance manager deals with quantitative data but in some cases, they also use qualitative data also, because there may have some non-monetary factors which have a great impact on the investment and financing alternatives. 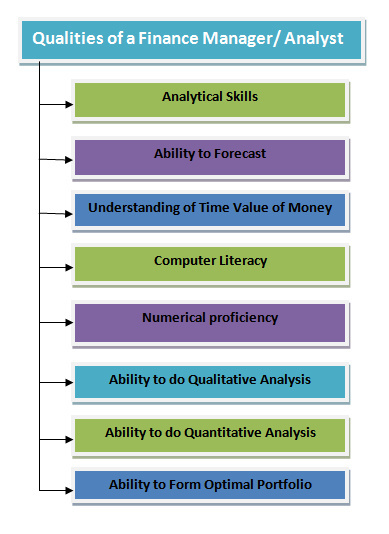 So both quantitative and qualitative analytical proficiency is required to have a financial analyst to take the right decision for the company. Not every people become the financial manager because to become a financial manager you have to understand all the necessary concept and ideas about financing and investment. Graduated from the background of economics, finance or from accounting may become a finance manager. But now a day’s finance background people are getting more preference because of understanding of proper understanding of what finance is all about. If you dreaming to become finance manager or analyst then you should study finance first and get BBA, MBA in finance and finally try to become CFA. Although around the world you can find there is a higher demand for finance job but in our country (Bangladesh) it was hard to find a pure financial job. But now a day’s opportunity is creating for the finance students. Hope in future there will be a higher demand for finance manager/ financial analyst in the corporate businesses.